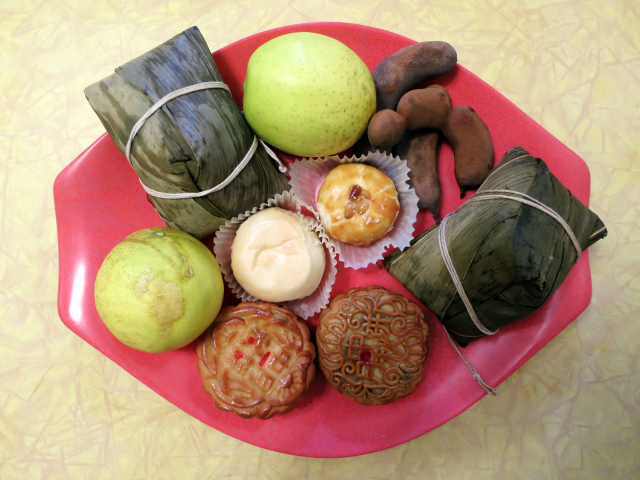 Across Asia yesterday, people celebrated the harvest and family unity at the Moon Festival or Mid-Autumn Festival. Honolulu is the first place I’ve ever lived where I had access to locally baked mooncakes (not to be confused with moon pies). And so I bought mooncakes for the first time, filled with sweet lotus paste and double salted egg yolks, at a Chinatown bakery, along with zongzi, savory sticky-rice dumplings wrapped in leaves. A friend gave us more small Chinese cakes, and our upstairs neighbor and landlord gave us two very round lemons from the tree by our back door. We celebrated the small but heartwarming harvests that Honolulu has already offered us: the pods from the several tamarind trees we have identified on and near the University of Hawaii campus, our first taste of lilikoi (local Hawaiian passionfruit) which our home-stay host invited us to pick from his front-yard vines, and the herbs and fruit our landlords frequently offer us from their yard. Hope you are having a thankful harvest season, whether in town or country, during this mid-autumn full moon. This entry was posted in Blog and tagged food, foraging, honolulu, local time, seasonal. Bookmark the permalink.